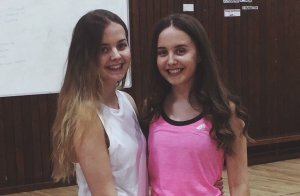 As a student at Chellaston Academy, Amy Heaton, 18, has taken an increasingly keen interest in volunteering and coaching. She explains how she as developed her skills in conjunction with her studies. "I first started coaching through the Sports Leadership programme offered by my school and went on to successfully complete Level 1, Level 2 and Level 3 Sports Leadership Qualifications. Through this, not only did I learn the values of sportsmanship, leadership and coaching, but I also developed a strong enthusiasm to working with children of all ages and have thoroughly enjoyed helping them improve both their physical and social skills. This scheme was such a great opportunity for me, as although I was very passionate about PE, inspired through lessons at school, and actively involved in my own sporting hobbies, I'd be the first to admit that I was never the best at any of the mainstream sports. Therefore, it gave me a completely different perspective on sport and physical education making me appreciate the different roles incorporated (participants, coaches, volunteers etc). My biggest thanks to Mr Lowery for all the enthusiasm and support, as this course helped me to find my place in sport through coaching. Amy puts her Gains with Ames group through their paces. As a Sports Leader, I taught PE lessons in various different local primary schools, running multi-skills events at secondary schools and tag rugby festivals, as well as volunteering and umpiring at my school's sports days and games throughout the years. Alongside this, my academic studies and a growing love for competing in my sport - dressage - I also found time to enjoy coaching beginners; teaching private lessons, running group sessions and fun days following the role as group leader and coach for our family-run business at Oak Tree Stables. I still often teach beginner horse riding lessons (under BHS supervision) but have now, more recently, focused my coaching within fitness. The group who helped raise money for BBC Children in Need. 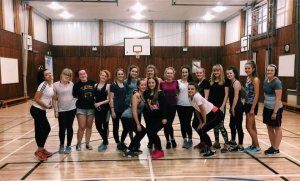 Last term, before Christmas, I voluntarily set up my own girls' fitness class, free of charge, for my sixth form at Chellaston Academy in order to increase participation rates and make it more accessible and enjoyable for girls my age to exercise among the stresses and high demands of A levels and life in general. This is a weekly class, nicknamed 'Gains with Ames' and was only supposed to be running up until Christmas, however after popular demand I'm now continuing it through the Spring term. 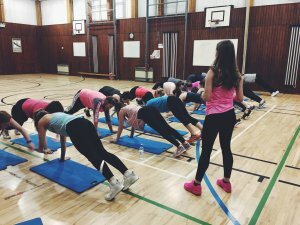 Within this, I also incorporated a fitness fundraiser to raise money for Children in Need, raising more than £100 in just a one-hour workout session! I also recently helped out at the Derby School Sport Partnership This Girl Can Christmas Festival. It was great to see how larger events ran, and I'm looking forward to volunteering at more of their events this year. 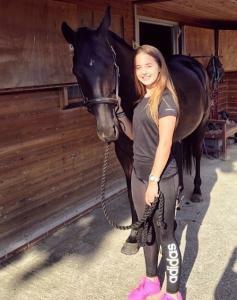 Amy is passionate about horses and regularly rides competitively. Being part of the Leadership Academy at Chellaston, and also the Derby City SSP Young Coaching Academy, has enabled me to progress my own leadership skills and given me the ability to prepare and organise teams, while learning the rules of different sporting games. However, most importantly, coaching has improved my confidence to a whole new level I didn't know existed. That's not only through delivering the actual coaching sessions, but through networking and support groups that have reassured me along the way. The ability to coach, paired with my high work ethic and positive attitude, will now hopefully enable me to succeed in the future through sport and other fields. The best thing about coaching and volunteering for me is being able to share my passion with others, and helping them to succeed and enjoy meeting their own goals. I also feel like I benefit just as much as the people that I coach do. It's enjoyable, I'm gaining experience and staying even more motivated. Seeing others enjoying the session as much as I am delivering it really keeps me motivated. I also a great sense of pride knowing that you've helped someone and given back to the community. 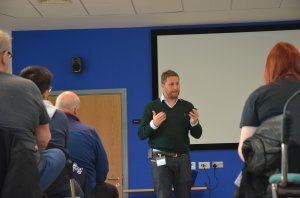 Amy was one of a host of coaches who attended the Derbyshire Sport Coaching Conference in November, which featured professor Damian Hughes. I was honoured to have been invited to this event through Coaching Derbyshire's This Girl Can Coach Programme and found it extremely informative and inspiring. I was also offered relevant advice through the Street Games workshop - Engaging Women and Girls - which proved beneficial for setting up my girls' fitness class. In addition to this, it was also great to meet and interact with a wide range of coaches from all different sporting backgrounds and fields. This Girl Can Coach has helped Amy on her journey. 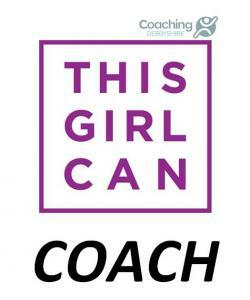 I am hoping to complete my Intermediate Level 2 Fitness Instructor course through the funding of the This Girl Can Coach Programme in order to gain a recognised REP's qualification. I can use that to act as a fundamental base for my future career based in sport and exercise. I then wish to continue my educational knowledge through more qualifications and courses, as I believe a coach (especially in this particular field) should strive to broaden their knowledge even further. Not only does it help you to stand out with university applications, but it also gives you a positive, alternate motivation and focus while learning vital life long skills that can be transferred in any career you are wanting to go into, not just sport."